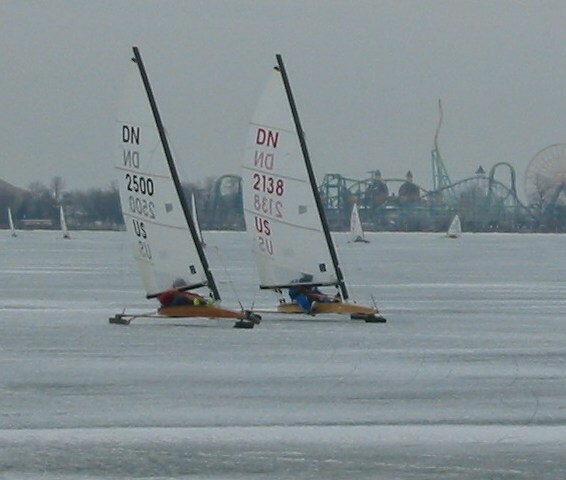 What's an iceboater to do when the lakes melt? Today was a day for finishing up. 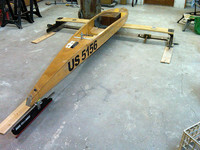 The big project was mounting the plank to the hull and doing an alignment. I also spent some "quality time" on the sharpener getting rid of a couple of small flat spots on my inserts. Well, today the everything came together for the first time. There were no parts (at least temporarily) left in the box from when I disassembled the boat after the crash. I pulled all the clamps off, quickly cleaned off the excess epoxy, and eagerly checked the deflection. It looks pretty good, about 145 lbs/inch so it deflects just under 1 3/4 inches with me on it. I'm guessing it will stiffen up a bit as the glue gets to full cure, and rounding the edges will probably soften it, so it will probably end up very close to this value. 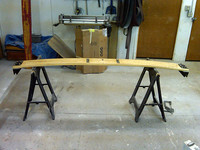 The final (and most lengthy) part of the repairing my DN after the crash on Jan. 2nd was to build a new plank. One of the biggest hassles in finishing a DN is getting the plank mounting hardware in the right place (and the same place on multiple hulls and planks). Last fall when I was moving the plank attachment from external to internal on my backup hull I decided I wanted to have all my gear interchangeable. The easiest way to do that was to make a jig that locates the holes for both the hull and plank hardware so they are correct relative to each other, and the same everywhere. Jan 10th - Hull is ready to go! After a week of working evenings my hull is back ready to go sailing. All the sanding is done and the hull-plates are screwed down again. 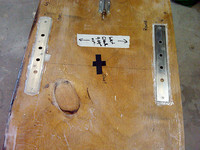 I edged the hull-plates with thickened epoxy to take some of the shear-load off the screws. I'd done this before and it seemed to work well in the de-planking, as the plates were able to pull away from the hull (relatively) cleanly during the crash. While I was working on the hull I augmented the bow-spring with a tennis ball and glued the tiller-head to the tiller-post. Tonight was relatively quick. 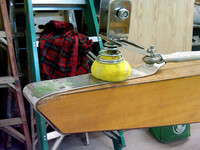 Some sanding of the lumps and drips from last night's work, then flip the boat upright and work on the cockpit-floor side of the hole punched through the bottom. A little work with the grinder/DA on the edges, then cutting and feathering the edges of the patch, and it was ready to glue. You can't see through the floor anymore! The edges of the hole are faired out and ready for the patch. Update: Check my blog here for more progress reports. Tuesday is the regular "Boat Night" at the Nordhaus Boatwerks, so I had plenty of company (and help) with repairs. I decided to start attacking the holes and gouges in the bottom. The first step was to feather out all the edges and make plugs for the access holes through the cockpit floor so I could fill in all the damage around them. In the first outing of 2011 a large crack opened up during the first DN race. I hit it on my last downwind leg. I don't really remember much other than seeing a small bump on the ice ahead of me, then a "bang! 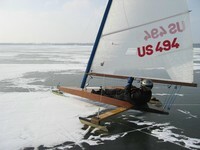 ", and the next thing I was sliding down the ice backwards (still in the cockpit) with my plank sitting on my chest. I was logging the race with my phone's GPS, so you can check out the track.